While these primary drivers are common across all data centers, no two data centers are designed to be exactly alike. Not surprisingly, variations between these primary drivers lead to cost differences between data centers that are not always evident from $/MW alone. 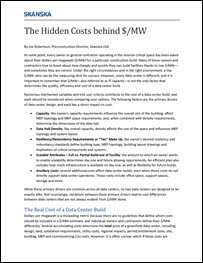 Download this white paper to learn more about the real cost of a Datacenter build.